Boston Renters: Can You Negotiate the Broker Fee? Over the past 10 years, we've seen another hurdle come into play - the "broker fee". In 2005 - according to MLS - about 1/2 of the loft rentals (I'm using lofts here as that's my specialty) in the Seaport District & Leather District combined were advertising that the landlord was paying the broker fee (to be split between the landlord's agent and the tenant's agent). In 2015, in both neighborhoods, I couldn't find ANY that the landlord was willing to pay the broker fee on, it was up to the tenant to pay the full fee (once again to be split OR just going to the landlord's broker directly). I'm pretty sure the reason is obvious: supply and demand, right? The market is flooded with prospective tenants, and landlords know they can fill up their vacant spaces pretty quickly. Funny thing though: in 2005, the average days on market for those Seaport & Leather District Lofts: 35 days. in 2015....... 48 days. Ok, in fairness, there were only SEVEN lofts in those areas in 2005, and SIXTY in 2015 that have been rented through the first 8 months. So, what's the story - why are tenants paying the fee and is it negotiable? Regardless of average days on market, landlords are still able to rent their units out quickly. There has been in influx of new buildings - especially in the Seaport District - BUT there's an abundance of renters out there, too. Last fall and into this spring, some of the new rental buildings were offering no broker fee (some didn't even need to market to brokers) AND a month or two off the rent to start. For the most part, those deal have dwindled. And remember this: if it's on MLS (and trickled down to sites such as BostonLofts.com, etc), it's most likely an individually owned condominium, NOT a unit part of a building owned by one entity. So, that landlord has to have the numbers make sense. If the landlord pays the broker fee, that landlord is essentially brining in 11 months of rent, rather than 12. Naturally, the flip side is that the tenant is paying 13 months of rent if they pay the fee. Ok, so it's out there and listed as "tenant pays broker fee".... can you negotiate? It's simple - it comes down to the other prospects waiting in the wings, and how strong of a tenant candidate you are. No landlord will eat what's equal to a month's rent if they can rent to someone else, BUT, my suggestion is: ADD VALUE as a tenant. When you come to the appointment, have a Rental Application ready to go. You can get one easily on-line - it's the standard GBREB Rental Application - GOOGLE IT, OR ask the broker you are meeting to send you one in advance. Besides the Application, have proof of employment (letter from HR, recent paystubs, etc), and a recent Credit Report in hand. (Oh, and checkbook too, of course!). You'll make a better case by being prepared and ready to go, rather than saying you like the unit, but need a few days to get your info together. Nothing makes an agent happier than telling the owner that the tenant is interested and oh yeah - he or she came ready with their info and checks! "By the way, they want you to pay the fee or at least half, but they'll sign immediately upon approval" is an easier and more fruitful conversation that the landlord might agree to than "the tenant wants you to pay the fee, and didn't leave me any info, just shooting one across the bow". I guarantee you, you'll be paying that fee Mr or Mrs Tenant if the agent is telling that latter story. 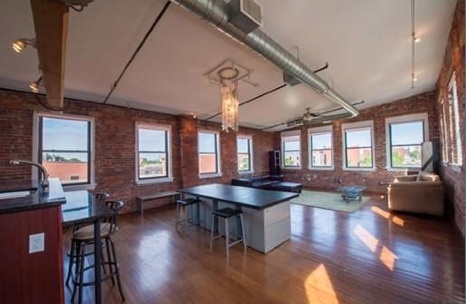 Gorgeous Brick and Beam Penthouse Loft at Munroe Lofts in Lynn - NO FEE!